When we last left Hiccup things were getting very dark indeed. The Dragon Rebellion has begun. Snotlout is the new Chief of the Hooligan Tribe. Stoick has been banished and given the Slavemark. And Alvin the Treacherous has EIGHT of the King's Lost Things, and has been proclaimed the new King of the Wilderwest ... But what can Hiccup do, now all alone and in exile, hunted by both humans and dragons? Can he find the Dragon Jewel, mankind's last and only hope and become the Hero once again? 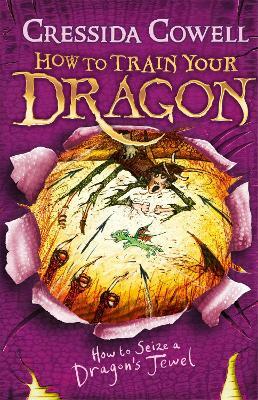 Another Cressida Cowell book you don't want to put down. My 9 year old daughter and I both love Hiccup the unlikely Viking hero. There are more twists in the story than a twisty turny thing. The only trouble is trying to get the bedroom light off as you want to read till the end. If you haven't read any Hiccup books then do, they are fabulous. Much better than the film. I would recommend you start at the beginning otherwise you might miss the point if the quest, although you could read the story in isolation. Can't wait till the next book in the series comes out.